The London Zoo opens at 10am and closes at 4pm. The last admission is at 3pm. The London Zoo is open every day of the year with the exception of Christmas. We are comparing London Zoo Ticket Prices from leading ticket suppliers and Try to find you Cheap tickets prices on the market. With the entrance ticket to the London Zoo, you enter the world of animals from all different regions of the world. In the London Zoo, you will examine over 700 wildlife species inhabiting enclosures emulating their natural habitats. Among other themed areas, the zoo has the tropical rainforest, African forest and the Lion Temple where Asiatic lions roam. Aside from the standard observation of wildlife from various sides of the world, you will attend feeding of penguins and see how they enjoy their Penguin Beach. Take a look at African giraffes, Galapagos tortoises and other interesting wildlife species. Besides diurnal, the London Zoo has a section where nocturnal animals live, including bats, armadillos and Slender Loris. The skip-the-line ticket saves you time as it allows you to bypass queues to enter the London Zoo. The zoo of London is inhabited by hundreds of wildlife species from all corners of the globe. Hence, it is ideal for anyone who is curious to discover how the life outside the human settlements looks like. Your Experience With London Zoo Ticket? You will visit one of the most acclaimed zoos in the world. 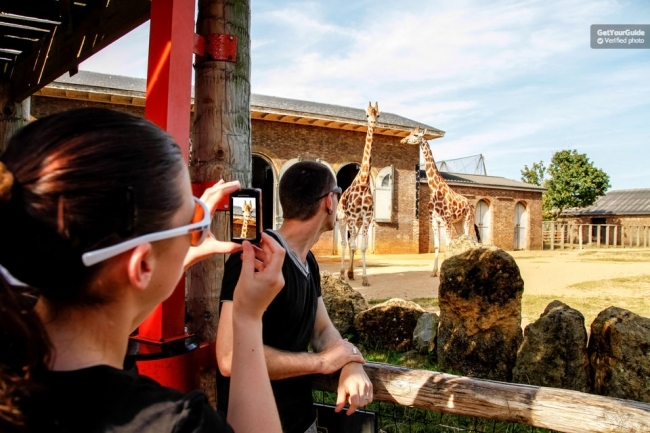 Depending on the selected option, you will skip lines to enter the London Zoo and make the most of your visit. As you tour the grounds of the zoo, you will see several hundred animal species from all sides of the world. Get yourself acquainted with diurnal and nocturnal animals, each group in the area featuring the time of a day when they are active. Walk through the rainforest environment of the London Zoo and examine sloths, marmosets and other animals. Visit the kingdom of gorillas, emulating the African forest. Also, test your courage in the Land of Lions, where only wires separate you from Asiatic lions. What London Zoo Ticket Includes? Standard or fast track entrance to the London Zoo. There is a London Zoo app you can download to learn more about your favourite animals. For around £125, you can book a workshop that will learn you how to take photos of the animals. Travelers Reviews about London Zoo Ticket? A visit to the London Zoo has a 4.5 rating from users of Get Your Guide and the 4 rate on TripAdvisor. The comments of some visitors indicate that it is important to visit the zoo on a nice day. Otherwise, you may see fewer animals because they take shelter. Most of the London Zoo is accessible to visitors in wheelchairs. You can show either paper or a mobile voucher to gain entrance to the zoo. You can receive the full refund for cancellations made the specified number of dayd in advance. The free cancellation period varies between tour providers. You should take the map at the info point of the London Zoo. Since the complex is so huge, you could easily miss something. Address: London Zoo, NW1 4RY.